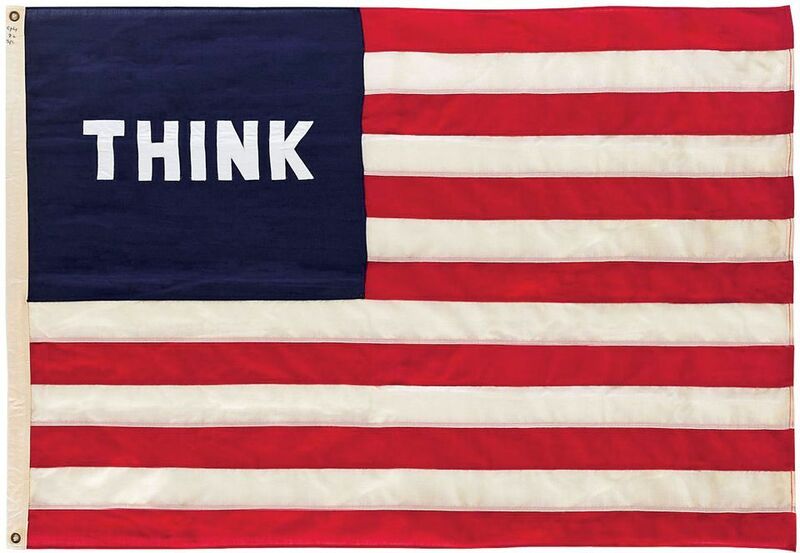 In 1972, the Surrealist artist William Copley produced Imaginary Flag for USA—a simplified version of the Stars and Stripes with the word “think” written in capitals in the top left-hand corner. It was created at one of the most turbulent times in US history, as the Vietnam War drew to a bloody close and the nation was gripped by race riots and the arrests that would soon expose the Watergate scandal. For Helmut Friedel, the curator of America! America! How Real is Real?, the image has acquired a new resonance in the light of the election of Donald Trump, an event which sparked the ideas behind this exhibition. It presents 70 works by major US artists from the 1960s until today, all dealing with the relationship between time, history and documentation in an era of mass media and consumption. Some have been drawn from the Frieder Burda collection, others from museums across Austria and Germany. The show is broken into three distinct parts. The first, focused on Pop art, documents the disillusion of artists with the American Dream (the subject of the film America America, the exhibition’s title referring to the 1963 movie by Elia Kazan), from Andy Warhol’s Five Deaths (1963) to Alex Katz’s blank portraits. The show’s second section looks at artists dealing with narrative and representation, from Cindy Sherman’s “self-portraits” to Robert Longo’s The Haunting series (2007)—apparently real but in fact artificial photographs. The final section deals with ways of representing time and information, from On Kawara’s I Got Up Series (1968-79) to Jenny Holzer’s 1994 work Untitled (Truism), which consists of a series of LEDs presenting two letters at a time, leaving viewers in a perpetual state of catch-up as they try to deduce the words and meanings.